A “humanitarian cease-fire” that went into effect 10 AM local time was holding, at least for its first hour. The cease-fire, requested by UN officials, is set to last through 3 PM local time, giving Gaza residents five hours to stock up on supplies – and giving rocket-weary Israelis five hours out of the bomb shelters that have become second, and in some cases primary, homes over the last ten days of incessant rocket fire by Hamas terrorists. The IDF said that it would abide by the cease-fire as long as Hamas did. Foreign reporters in Gaza said that the army had sent text messages to Gaza residents' cell phones warning them that the IDF would immediately react if Hamas violated the cease-fire, which it agreed to. 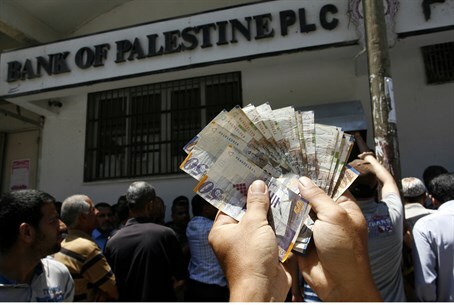 Reports from Gaza said that residents went out to go shopping and buy food and medicine, and to take money out of the bank. Hamas warned Gazans to "be aware that Israelis were tracking them to gather intelligence on their movements." The situation Thursday was far different from that on Wednesday, when a cease-fire that was supposed to go into effect was rejected by Hamas and immediately violated. That cease-fire, proffered by Egypt, was flatly rejected by Hamas, on the claim that it had not been “consulted” with before the terms were set. Reports Thursday morning said that Israeli and Hamas negotiating teams had arrived in Cairo to discuss the cease-fire proposed by Egypt. The cease-fire was first proposed by Egypt Tuesday night and was accepted unilaterally by Israel, as Hamas continued to pound Israel with rocket fire. Later Wednesday, Israel responded to the Hamas attacks, striking back at terror targets in Gaza. Earlier Thursday, Hamas “greeted” the cease-fire with a major rocket attack on Israel. Red Color alert sirens were sounded in communities throughout central Israel. Sirens were sounded in Tel Aviv and its suburbs, Raanana, Hadera, and in the Netanya area as well. Iron Dome batteries shot down several of the missiles, with others falling in open areas. No injuries have been reported. Minutes before, a barrage of rockets was fired at Beersheva. The Iron Dome system knocked out four of the missiles. No injuries have been reported. Hamas also accepted responsibility for an attempt by 13 terrorists to enter Israel earlier Thursday via a terror tunnel. In the early morning hours of Thursday, the army said, IDF soldiers identified a group of 13 terrorists attempting to enter Israel via a tunnel in the southern Gaza Strip. The tunnel was one of several the IDF had recently uncovered that were to be used to smuggle terrorists into Israeli cities. IDF soldiers attacked the group. Several fatalities were reported. The tunnel has been destroyed, as well.